The idea was simple: Come to Gizmodo headquarters, drink beer, and build stuff with colorful plastic bricks. So last night Gizmodo readers flocked to the Flatiron district and did just that. It was an awesome party. After four heats of furious building, the Gizmodo staff picked our favorite creation: a wild tower that suspended a minifig over a shark tank. This structure was the best iteration of the party’s theme: architecture. It was also just super well executed. 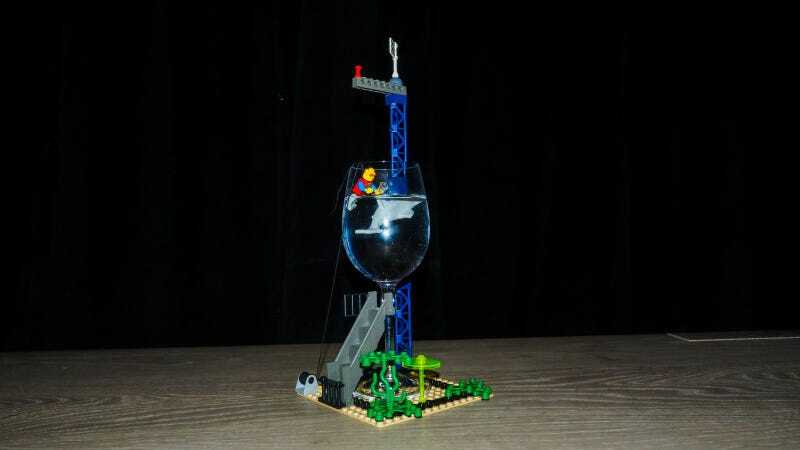 Cleverly, the winning builders repurposed an empty wine glass to hold the vicious shark, and the effect was just too fun. Other notable creations included a well-planned (but not architecture-themed) Pikachu, a creepy discoball shrine surrounded by the heads of lost minifigs, a wild Mad Max-style vehicle that defied the laws of physics, and something I can only describe as a pineapple death ray. Images of some favorites are posted below, and you can find more here. Stay tuned for the announcement our next Gizmodo block party. We have all these bricks now and need people to build with them!